Blindness - body, causes, Is There Hope in the Darkness? Blindness is the absence of all or most vision. Corrine tried to imagine how she would describe a bird to her sister Amy, who might never be able to see one. She could say that it is small, that it has feathers, and that it sings. At least those are the things her sister can feel and hear. But how could she describe the red of a male cardinal and distinguish it from the reddish-brown of a female cardinal, when Amy might never see anything at all? And what about all the other things Corrine's sister might not see: the television shows and the movies, the picture books Corrine saved to give her, the blue sky, the faces of their mom and dad. Corrine's sister Amy was born prematurely. The doctors told Amy's family that she had retinopathy (ret-i-NOP-a-thee) of prematurity. This condition results when the blood vessels in the eyes of a premature baby grow abnormally and cause bleeding and scarring. It may result in total or partial blindness. More than 1 million people in the United States are blind, which means they cannot see at all or their vision is very poor. Another 14 million people have severe visual impairments that cannot be corrected with eyeglasses, according to the group Research to Prevent Blindness, Inc. Many diseases and injuries can cause blindness. There are treatments that can restore partial or complete eyesight for some people with blindness. Others, however, will remain blind for the rest of their lives. Is There Hope in the Darkness? Corrine's sister Amy might not lose her vision. Doctors now can use a probe to "freeze" parts of the eye and prevent permanent damage from retinopathy of prematurity. Thousands of other people with potentially vision-threatening conditions, such as strabismus * , glaucoma * , and cataracts * , also can benefit from treatments, especially if the disorders are detected early. Others whose conditions cannot be reversed or improved may benefit from special devices like voice-recognition software for computers and from programs that train guide dogs to assist with daily tasks like walking, going to school, and working. Many conditions may cause blindness. The most common cause of vision loss in infants and young children is amblyopia (am-ble-O-pe-a). * strabismus is a condition that causes the eyes to cross or not work together correctly, which may lead to permanent loss of vision in one eye. * glaucoma is a group of disorders that cause pressure to build in the eye, which may result in vision loss. * cataracts result from cloudiness of the lenses in the eyes that usually develops as a person ages. They often impair vision. Anatomy of the eye. The optic nerve (also referred to as the second cranial nerve) sends messages from the eyes to the brain, making it possible to see. the eye that is not pointing straight can be trained to develop normal vision. For some people, surgery is needed to align the eye correctly. Some children are born with cataracts, which cloud the lens in the eye and prevent images from being seen clearly or at all. People also develop cataracts as they age, which makes it one of the most common causes of reduced vision. More than 400,000 new cases of cataracts develop each year in the United States. Surgery to remove cataracts is common for adults and for those few children with them. This restores vision in more than 90 percent of cases. Diabetes may lead to vision loss if diabetic retinopathy develops. Diabetic retinopathy, one of the leading causes of blindness in adults, results in vision loss if blood vessels supplying the eye's retina * are damaged by the disease. The blood vessels sometimes leak or break open to damage the retina. More vessels also may grow and start to cover the retina or grow into the fluid that fills the eyeball, further reducing vision. Researchers estimate that as many as 10 million to 15 million people have diabetes in the United States and 700,000 are at risk of developing diabetic retinopathy. Almost all people with diabetes can show signs of damage to their retina after two or three decades of living with the disease, but not all of them lose their vision. There are no symptoms of diabetic retinopathy at first. As the damage increases, vision becomes blurred. Doctors can see the damage with a device that looks at the retina, which is why annual vision exams are so important for people with diabetes. The best treatment for diabetic retinopathy is prevention, which means managing diabetes (and high blood pressure, if present) with proper nutrition, exercise, and medications. In some cases, laser treatment may be used to prevent worsening of diabetic retinopathy. People with diabetes also are at higher risk for cataracts and glaucoma. Glaucoma is a disorder that causes fluid pressure to build up inside the eye, which may cause optic nerve * damage. It may go undetected for many years before its effects on vision are noticed. It is one of the leading causes of blindness in the United States, with elderly people and people of African ancestry at increased risk. Trachoma is a chronic infection of the eye by Chlamydia trachomatis bacteria. The bacteria infect the linings of the eyelid, causing them to become thick and rough. If the condition is untreated or if the infection returns, the eyelashes can turn inward and cause small scars on the eyes' surfaces. Eventually, blindness results. Trachoma is the leading cause of preventable blindness in the world. Trachoma is spread through contact with the discharge from the eyes of infected persons. For example, if infected people rub their eyes and then shake another person's hands, the bacteria that cause trachoma can be spread. Also, using the handkerchief or towel of an infected person can spread the bacteria. Today, about 10 percent of the world's population live in areas where trachoma is a problem, including Africa, Asia, Australia, Latin America, and some poorer areas of the United States. Treatment can stop trachoma before it blinds people. Antibiotic ointments or oral antibiotics are used to treat the disease. The World Health Organization (WHO) has established a WHO Alliance for the Global Elimination of Trachoma. WHO hopes to achieve its goal by the year 2020 through prevention, antibiotics, and surgery to repair eyelids. 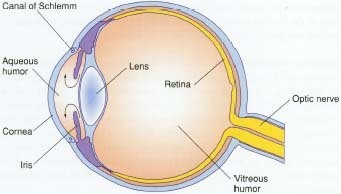 * retina is the area at the inside rear of the eyeball that acts like film in a camera to capture the image a person sees. * optic nerve is the nerve that sends messages, or conducts impulses, from the eyes to the brain, making it possible to see. The optic nerve is also referred to as the second cranial nerve. Macular degeneration is similar to diabetic retinopathy. Changes in the blood vessels supplying the central portion of the retina, known as the macula, cause the vessels to leak and to damage cells that are needed for the central part of the field of vision. Peripheral or side vision usually remains, but without treatment, the damaged field of vision may expand. Doctors sometimes recommend laser surgery to treat the leaking blood vessels when people are in the early stages of macular degeneration in order to prevent or slow progressive vision loss. Others compensate for vision loss by using magnifying devices. Ocular (OK-yoo-lar) herpes may cause vision loss as a result of herpesvirus infections, usually the herpes simplex virus that causes cold sores or the herpes zoster virus that causes chickenpox and shingles. The U.S. National Eye Institute estimates that ocular herpes affects approximately 400,000 people in the United States. Dorothy Harrison Eustis was an American living in Europe when she first saw German shepherd dogs used as guides for people with blindness. The dogs were part of a program to help former soldiers who had been blinded in World War I. She was impressed. The dogs allowed the retired soldiers to live more independently. With the dogs as their guides, the blind men could walk through and across crowded streets. As Mrs. Eustis wrote in 1927 about one such man, "No longer a care and a responsibility to his family and friends, he can take up his life where he left it off; no longer dependent on a member of the family, he can come and go as he pleases.…"
Mrs. Eustis returned to the United States in 1929 and founded the first school to train guide dogs in Nashville, Tennessee. Called the Seeing Eye, the school moved to Morristown, New Jersey, in 1931, where it remains. German shepherds often are used as guide dogs, although Labrador retrievers, boxers, and even mixed breeds also are used. The dogs begin their training at about 18 months of age with a sighted trainer. 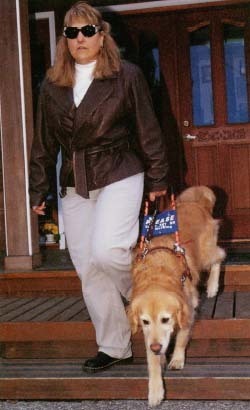 Then the dog is matched with a blind person, who spends three or four weeks working with the trainer and the dog. The dogs learn when to stop and when to go at street corners based on commands from their owners. They do not read traffic signs or lights in part because dogs are color blind. The owner listens to traffic sounds and tells the dog to go when it sounds as if traffic has stopped. But the dog is trained not to go if there is danger. Dogs also steer owners away from people and from objects in their path. Guide dogs wear a special harness when they work, but may switch to a regular leash during their off-duty hours. It is important not to approach or play with a guide dog when it is working. © Peter Skinner, Photo Researchers, Inc. Infection of the eyes by the Chlamydia trachomatis organism is a leading cause of blindness in developing nations. The eyes of newborn babies may become infected during childbirth if the mother has chlamydia. About 3 percent of cases of blindness occur from accidents or other injuries that damage the eyes. How Do People with Vision Loss and Blindness Adapt? become famous entertainers (if they're talented), like singers Stevie Wonder and Ray Charles. Helen Keller (1880-1968) became a writer and activist despite losing her sight and her hearing when she was not even 2 years old. She learned to communicate after she was taught to associate the movements of another person's hands with letters, words, and the objects around her. During the 1930s, Helen Keller lobbied the U.S. Congress to provide federally funded reading services for people who are blind. Her efforts resulted in the inclusion of Title X in the 1935 Social Security Act, establishing federal grant assistance for the blind. The story of Helen Keller's life, and the role of her teacher, Anne Sullivan, was made into the movie The Miracle Worker (1962), which won Academy Awards for actors Patty Duke and Anne Bancroft. It is available in many video stores and is often broadcast on television. The U.S. National Eye Institute, 2020 Vision Place, Bethesda, MD 20892-3655. The National Eye Institute is one of the U.S. National Institutes of Health (NIH). Its website has a search engine that locates information about blindness and vision problems, and its resource list provides links to over 40 other organizations that provide information to the public about eyes and vision. American Council of the Blind, 1155 15 Street NW, Suite 720, Washington, DC 20005. The American Council of the Blind has a monthly radio program called ACB Reports, a monthly magazine called the Braille Forum, a jobs bank, and "Speech Friendly Software" at its website. American Foundation for the Blind, 11 Penn Plaza, Suite 300, New York, NY 10001. The American Foundation for the Blind houses the Helen Keller Archive and publishes many print books, talking books, and a Journal of Visual Impairment and Blindness. Lighthouse International, 111 East 59 Street, New York, NY 10022-1202. The Lighthouse offers information, products, and publications about vision and blindness. It includes a Lighthouse National Center for Vision and Child Development, and posts a story called My Friend Jodi Is Blind at its website. National Federation of the Blind, 1800 Johnson Street, Baltimore, MD 21230. The National Federation of the Blind offers many resources for blind children and blind adults. Its website posts an informative fact sheet called Questions from Kids about Blindness and a newsletter called Student Slate: The Voice of Organized Blind Students in America. Research to Prevent Blindness, Inc., 645 Madison Avenue, New York, NY 10022-1010. This is a research organization for scientists, ophthalmologists, and the public. The Seeing Eye, Inc., P.O. Box 375, Morristown, NJ 07963-0375. This is the pioneer guide dog school in the United States. Its speech-friendly website provides an excellent overview of its history and of guide dog training. It publishes several videos and a Seeing Eye Guide. Blindness and eye disabilities may double by the year 2020, because post-war baby boomers are aging and many eye disorders are more likely to occur in old age.